25 September 1943. War correspondents Greg Clark of the Toronto Star and Ralph Allen of The Globe and Mail cooking Clark's 51st birthday breakfast in the courtyard of Castello di Lagopesole. Greg Clark, a soldier in World War I, was one of the priemier journalists of the Toronto Star. He wrote many humorous columns, often about family and outdoor life. He was made an officer of the Order of Canada in 1967. Ralph Allen is remembered mostly for his sports reporting. He was inducted into the Canadian Football Hall of Fame in 1990. 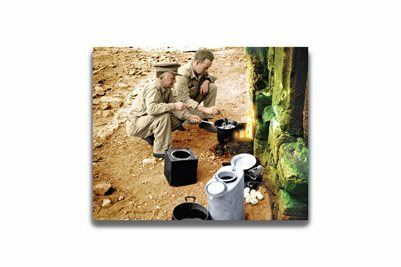 Both men loved the outdoors life, and look pretty happy to be enjoying some fresh eggs, cooked outside on an open fire. Please note, I had to cut off the top of this one because it was faded to white with very little detail. Original picture courtesy of Library and Archives Canada.